Mississauga, Ontario (Oct. 1, 2015) — NSF International has certified aquatechnik® PP-RCT fusion pipe for meeting stringent requirements of the NSF/ANSI Standard 61: Drinking Water System Components – Health Effects. As well, aquatechnik® brass fittings are certified lead-free under NSF/ANSI 372: Drinking Water System Components – Lead Content. 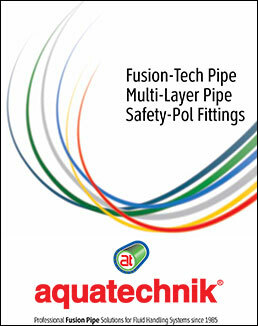 Together with its NSF/ANSI 14 Plastics Piping System Components and Related Materials certification, the NSF/ANSI 61 and NSF/ANSI 372 certifications open up the US and Canadian markets for the growing aquatechnik North America distribution network. NSF certified aquatechnik® PP-RCT piping systems come with a 30-year warranty, and feature distinctive white pipe with stripes, where red-striped pipe signifies a hot water application, blue is for cold water installations only, and grey-striped pipe is for mechanical systems. The aquatechnik® violet pipe is for rain water collection. About aquatechnik North America: aquatechnik North America is the exclusive distributor of aquatechnik® professional PP-RCT Fusion Pipe solutions for fluid handling systems. The company distributes aquatechnik product through authorized regional distributors to their qualified professional installer customers. Visit www.aquatechnikNA.com for more information about aquatechnik®. About NSF International: NSF International is an independent organization that writes standards, tests and certifies products for the food, water and consumer goods industries to minimize adverse health effects and protect the environment (nsf.org). Founded in 1944, NSF is committed to protecting human health and safety worldwide. NSF is a World Health Organization Collaborating Centre for Food and Water Safety and Indoor Environment. NSF International’s Water Programs require extensive product testing and unannounced audits of production facilities to verify that water treatment products meet the design, material and performance requirements. NSF International is accredited by the American National Standards Institute (ANSI). NSF led the development of the American National Standards for all materials and products that treat or come in contact with drinking water to help protect public health and the environment and minimize adverse health effects. In 1990, the U.S. EPA replaced its own drinking water product advisory program with these NSF standards. Today, all major plumbing codes require certification to NSF standards for pipes and plumbing components in commercial and residential buildings.